Every day of your life is a flip of a coin as to how it will turn out. If the coin comes up heads, you will have a good day, if it comes up tails, well, you are destined to have a bad day. It’s not that simple of course, we are just trying to make a point that at some point, you are bound to have a bad day. For example, locking your keys in your car can lead to a bad day, if you don’t make the right decisions. Cursing yourself and kicking your car will not make your day go any better. 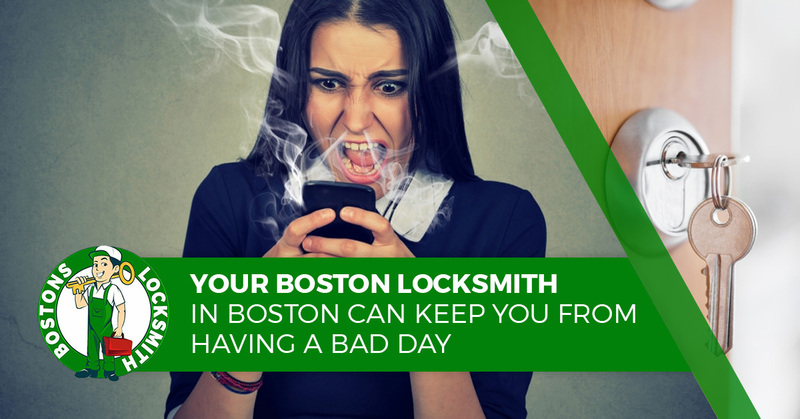 But if you call Bostons Locksmith, your automotive locksmith, we will be there in a short amount of time and have you back in your vehicle and on the road as soon as possible. In doing so, we save you from having a bad day. Unfortunately, there is a long list of things that can ruin your day that can’t be fixed with a simple phone call. For example, getting a sandwich from the local deli for lunch and opening it up at your desk to discover it has a horrible meat to bread ratio will ruin your day. And there is no number of calls you can make that will make things better, you are stuck with a massive amount of rye and a few thin slices of corned beef. Here are a few other examples of things that ruin your day. We are talking about the kind of texts that you have to close your eyes, hold the phone away from your body and press send with a smile of satisfaction on your face. You spent 40 minutes on that text crafting it into a perfect combination of flirtatious, intriguing, witty and coy that you can hear the recipient sweating as it is read. And then you get that one-word response. You get an “ok” or the dreaded LOL and your day is totally ruined. There are few things in life worse than walking into your place of work only to look down and realize you must have dressed in the dark. Whether your shirt is wrinkled, your pants ill-fitting or your socks mismatched, you look harsh in the light of day. Basically, you feel like a fool all day. You also feel like telling everybody you see that you don’t always dress like a nerdy kid at school. Regardless, your day is ruined and your locksmith can’t help. One minute you are standing under your shower, a scalding hot sauna of personal joy, and then suddenly it becomes a cold stream of water. It is at that point that you realizes you literally have no control over your life and the rest of the day is ruined because there is no happiness in a cold shower. Bostons Locksmith can’t help you when you run out of hot water, but give us a call when you are locked out of your house or car.